When the Great War began, like all eligible and fit young men, Marc Chagall (1887-1985) was conscripted for military service to his motherland, the Russian Empire. A more unsuitable soldier could hardly be imagined. The young artist, in his mid-twenties, had been stranded in his childhood home of Vitebsk, located behind the lines of The Pale of the Settlement. Chagall was merely visiting from Paris, a city he must have already considered his home. Letters to friends in France reveal his dislike of his plight and in a rather unpatriotic move, Chagall even applied for a visa to leave. His plea was ignored and, thanks to the kindness of his wife’s brother, he was posted to the safety of Petrograd where he worked as a clerk. Bella Rosenfeld was part of a wealthy family of jewelers and Jews of wealth were allowed some status in Russia. 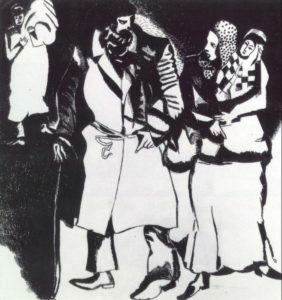 In addition, after the War began, Jews, presumably out of necessity, were mobilized which automatically granted them relative freedom of movement outside the Pale. The capital city, St. Petersburg, was renamed “Petrograd” a more Russian sounding name in contrast to “Petersburg,” which was distinctly German. Now patriotically renamed, Petrograd, as the capital city, would have been one of the major military centers where command and control was located. Yakov Rosenfeld was in charge of an army economic department located in the bureaucracy inside an entity called the Central War-Industrial Committee. The brother-in-law saved Chagall’s life by giving him a job that demanded little of him and allowed him to continue his work as an artist. 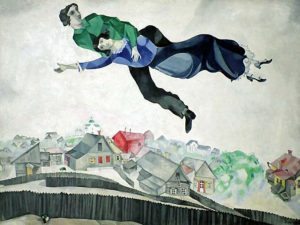 As a result Chagall’s output during the War was split between his recordings of the sights he saw in Petrograd and the flights of fancy inside his head which were totally disconnected from the war. In Petrograd, the wounded and dead poured in from the Eastern Front and the Winter Palace became a hospital. An Anglo-Russian Hospital was set up at the beginning of the war with equipment and staff coming from England by 1915 to help the Russians to cope with the casualties. The Russian Empire was utterly unprepared for war and food had to be shipped into the city by rail. But refugees coming into the city added to the civilian population and by 1915, the citizens were literally starving begging on the streets for food, standing in line for food forty hours a week. It would be no coincidence that the Russian Revolution would start in Petrograd, exploding from a march by women demanding food in 1917. In November of that year, Vladimir Lenin slipped secretly into the Petrograd, arriving at the Finland station and the Revolution was underway. A year later, in 1918, when Petrograd came under military threat, Lenin would be forced to move the capital to Moscow. 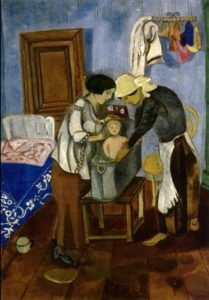 It was in the midst of such misery that Chagall painted the early years of his married life, the bliss of being in love, the birth of his first child, as if Ida were not crying for milk and aggravating the new father. Revolution was brewing even as strictures against free movement were ending and Jews were beginning to travel freely. The city was full of prisoners of war, who, were not allowed in shops but were allowed fairly free movement, if they were escorted. These new people and the modern crowds of strangers swirled on the streets lined with elegant neoclassical buildings, designed to evoke the grandeur of the past. 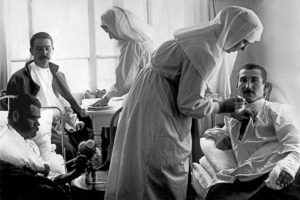 Given the presence of military hospitals in the city, wounded soldiers were everywhere, living reminders of the catastrophic causalities suffered by the army. 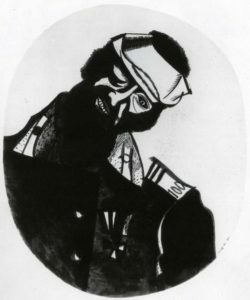 Most of Chagall’s response to the war were black and white sketches of soldiers, apparently based upon sights he had seen in the city–departing soldiers, wounded soldiers–the sights of war. This format, reminiscent of the lubok tradition, the limitation of color to stark contrasts, was totally uncharacteristic of Chagall who had been know for his vivid colors, but the approach was wholly in concert with the way in which Russians reacted to the War. There was something in the air, a psychological aspect to their war that led some artists to return to conventional aesthetics. War’s stark and unpleasant reality challenged those at the front and the millions left at home to consider existential questions. Thinking about war fostered an atmosphere of sobriety and reflection..Traditional motifs allowed viewers and artists to comprehend the trauma of mass war and the mystery of mortality and the presence of familiar classical, romantic, or religious images in the popular culture of the war in Europe attests to a universality of sorrow and bereavement. Russians of all stations in life expressed feelings of nostalgia and grief through symbols that echoed the pat in content and form..The war’s emotional impact was important in changing the art of Marc Chagall..he began to drop the cubist and expressionist leanings of his Parisian work for a series of pictures that used more conventional perspective, color and composition..The great conflict itself attached his eye and inspired him to engage war through his art. 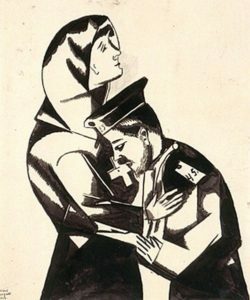 In a striking series of ink sketches, the artist memorialized wounded soldiers whom he saw around him..
Chagall’s output during the war was inconsistent, deviating from his personal history, his marriage, his life with Bella, and the sights and sounds of War that were everywhere. His life was bifurcated as well. On one had, he was a soldier of sorts, serving as a clerk, on the other hand he was still a practicing artist. It was during the war years, that Chagall was able to establish himself as an artist in Russia. Certainly his reputation as a Parisian based painter added to his luster and according to Jonathan Wilson, he showed twenty five paintings in Moscow at the Michailova salon and sixty three paintings at the Dobitchina gallery. In addition, Wilson added, Chagall sent forty-five works to the famous “Jack of Diamonds” show in Moscow. Wilson does not stipulate but we can assume that the bulk of the work exhibited in Russia was work executed since his return from Paris. But in a letter to Aleksandr Nikolaevich Benois, the designer for the Ballets Russes, Chagall himself wrote, asking for help on the eve of the Revolution, referring to his time in the military: “..in those three years I did almost no work (I do not count the Vitebsk series made in the middle and end of 1914, before my army service.” It seems probable that Chagall, in Vitebsk on a temporary visit, did not bring a great deal of art with him, and that his is referring to the work he did in his home town before he married Bella and moved to Petrograd in 1915. So it is the Vitebsk works about which the reviewers appear to be writing. On the 26th of October, Lenin’s Bolshevik forces stormed the Winter Palace, announcing at 5 a.m. that they had seized power. By the end of October, the provisional government had toppled, street fighting erupted around the Kremlin in Moscow..In Petrograd, mobs went on the rampage and looted shops, while soldiers wrecked and robbed bourgeois apartments, killing as they went. The capital emptied out..the population of Petrograd fell from 2.5 million on the eve of the revolution to 700,000 in 1919. 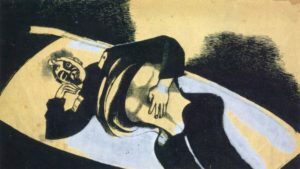 Although most young artists from Russia wanted to see a regime change, most remained under the radar and few were overt revolutionaries. Chagall, an artist who had every intention to return to Paris and make his life and career there, cannot be called a political individual when it came to Russian politics. But, as a Jew, he could not help being captured by the romance and excitement of a Revolution which offered, not a regime change, but a new way of life that promised emancipation for the Jews. The intelligentsia, which had learned to be discrete, were suddenly liberated and, in their enthusiasm for the Revolution, were politicized. Many artists, as shall be seen, put their art in the service of the Revolution, declaring themselves to be “engineers” and art to be “dead.” Chagall, on the other hand, seemed more interested in serving, not the Revolution, but the people through free artistic expression. His old friend from Paris, Anatoly Lunacharsky was now the “People’s Commissar of Enlightenment” (also known as an acronym Narkompros), after years of living in exile in Paris. And he was given the task of changing the education of Russian people and the direction of their culture away from Czarist goals and towards the desires of the Revolution. Although he had initially been invited to take part in the Revolution as an artist, Chagall backed away, but over time he became more enthusiastic about the changing times and literally became a new man. With a new haircut, close cropped and without curls, Marc Chagall returned to Petrograd and approached Lunacharsky with a suggestion for am art college in August of 1918, a few months before the War ended on the Western Front. Lunacharsky responded by appointing his friend a “Plenipotentiary for the affairs of the Province of Vitebsk,” a rather heady title, but not an uncommon one. For example, Aleksandra Ekster was given the same title for Kiev, and many of the other appointments came from among the Jews who were suddenly elevated in this new Russia, where they were being integrated into the culture. The attention from Lunacharsky, following upon the heels of Chagall’s exhibitions in Moscow would have consequences. Here was Chagall, an artist who had acquired prestige in Paris, a burnishing that few could match, invading the tight knit world of the Moscow artists and challenging them with art that was conversely based in Russian culture and in Jewish folklore. As the “Plenipotentiary for the affairs of art of Vitebsk,” Chagall needed a place for his art school and began his planning during a time of transition and turmoil. In March of 1918, the new Soviet government moved the capital away from Petrograd to Moscow, an act that was on one hand practical–the fighting have shifted far too close to the city–and a symbolic act, signifying a turning away from Europe, for Petrograd, a port city, faced West. The new capital of Moscow located far inside Russia, announced an inward turn towards the indigenous culture and away from European ties, but Lunacharsky stubbornly stayed in Petrograd, apparently disregarding the signals so clearly given. And then there were ruthless actions. The Russian Revolution churned up strong feelings and otherwise decent people did unfortunate acts. 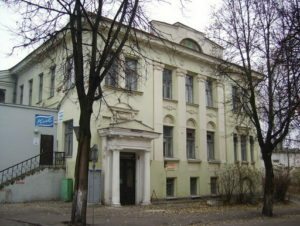 The building confiscated by the new government for the art school was owned by a wealth Jewish banker, an action in which Chagall apparently participated. The banker, Israel Vishnyak, had done little to deserve his fate, which would be tragic. The banker was a philanthropist who gave back to Vitebsk for years, sharing his wealth. But his good deeds counted for nothing–he was from the old world of patronage. The house was nationalized or taken over by the government in November 1918, one day before the Armistice. With few apparent qualms, the artist moved himself and the family into the now empty mansion, where the faculty lived on the third floor. The former banker’s home was now the People’s Art College and Art Museum. Far from home, Vishnyak died destitute. 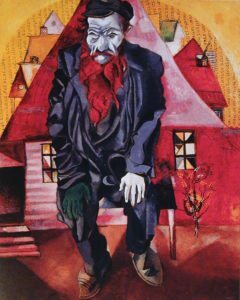 For Chagall, the first years in Vitebsk, when he was in charge of his own school were happy ones. His war was over and it seemed as if a new world had opened up. His paintings returned to their mode of happy fantasies, full of a joyous spirit so beloved one hundred years later. But Lunacharsky commanded that Chagall and the other Plenipotentiarys to celebrate the first anniversary of the Revolution in October 1918. Chagall, in response, passed on the command and summoned all artists and sign painters to the public cause. “All artists, decorators and painters are required to appear every day at the commission for the decoration of the city of Vitebsk for the October festivities to register and be assigned various tasks as requested by the commission. Those who do not appear will be considered conscious evaders.” Most of the Plenipotentiarys responded by producing street art, designed for the public in a proletariate style–popular culture replacing elitist “fine art,” in response to Lunacharsky’s vision of streets decorated with lengths of canvases with “lovely colors” to celebrate the anniversary. In Petrograd and Kiev, swathes of cloth shrouded old buildings, suggesting oppression and the end of aristocratic rule, now dead and buried with joyous new clothing. By the beginning of 1919, the new Art School could begin. As Chagall wrote, “Let the petit bourgeois malice hiss all around us, we hope that new artists-proletarians will soon emerge from those working people.” The artist had gotten the nomenclature of revolution down but he was not a savvy politician. Perhaps few could survive on the constantly shifting ground of the Revolution, but at first it seemed as if Chagall was organizing the school well. He was able to recruit artists to come to Vitebsk because the city had food, something that other locations, even Moscow, lacked. Therefore, a rather complex group of disparate artists, including Chagall’s former teacher, Yuri Pen, the critic, Aleksandr Romm, Ivan Puni, El Lissitzky and Kasimir Malevich arrived and started teaching. Suddenly a city of the Pale became a major center of avant-garde. It is important to stress that the artists came to Vitebsk for food and shelter in an uncertain world turned upside down..and they also saw an opportunity. 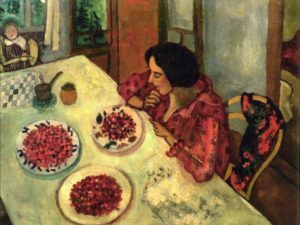 The artists did not necessarily come to Vitebsk to work with Chagall, an individual with whom they had little in common, either artistically or culturally. The artist had studied in St. Petersburg with with Léon Bakst (Lev Rosenberg), instead of studying in Paris and in Paris he had taken his own path. The other artists were honed in Moscow, a world very different from Paris. Malevich was more doctrinaire and was “Russian” in a very different way from Chagall, practicing his own “ism,” Suprematism. 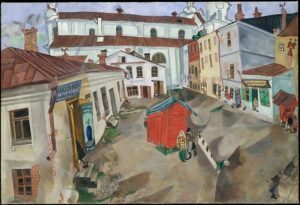 In his review of Vitebsk: The Life of Art, Joshua Cohen explained the situation in Chagall’s school. At first, the artist was very well connected. As Cohen noted, “..the painter David Shterenberg, who’d occupied neighboring studio space to Chagall at Montparnasse’s debauched La Ruche, recalled himself to Russia, straightened his tie, combed his hair and was made head of Narkompros’s Department of Fine Arts, which was known by the acronym IZO.” Chagall’s work in Vitebsk was devoid of Parisian influences and he returned to his Jewish roots, asserting the Russian-ness of being Jewish, an approach that fit very well into his vision that the School would train lower class people, especially Jews, like himself. For a time, he became very prominent, and at the first State Exhibition of Revolutionary Art in Petrograd, Chagall had two rooms to himself. “..a Smolensk Jew named Eliezer (Lazar) Markovich Lissitzky left home to work and teach not in any of the Russian capitals but in Vitebsk, renamed himself El and, with the arrival of his future mentor, painter and theorist Kasimir Malevich, the depiction of the local rabbinate and landscapes took a sharp turn for political tracts and geometry. In the fall of 1919, two Octobers after the October Revolution, as it was now being called to distinguish it from the Revolution of February of the same year, the school hosted the arrival of Malevich — whose art was apparently the logical, super-planar, supra-dimensional extension of such concepts as “Cézanneism,” “Cubism,” “Cubo-Futurism,” “Futurism,” and “Constructivism.” Malevich’s “Unovis” group eventually ousted the retro Chagall from the school; “students” became communist “apprentices” — and so would invent their own movements and histories. Accounts of what happened between Chagall and Malevich vary. It seems that the students of Chagall were, in the end, more attracted to Malevich and his vision of Suprematism. 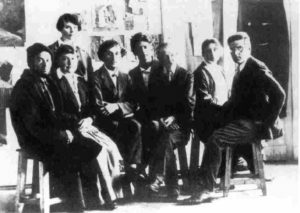 What ever the truth, the shift of the students had been preceded by quarrels with the faculty and Chagall and after only a year, the artist lost control of the School. 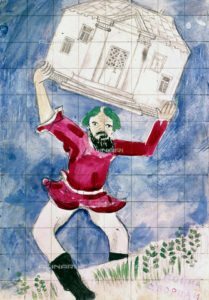 True, the artist’s fame often took him to Moscow where he was involved in the Moscow State Yiddish Theater, and while he was out of town, Malevich took advantage of his absence and ousted Chagall, renaming the school, the Vitebsk Artistic and Practical Institute. 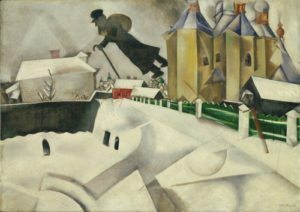 Less that two years after his appointment, in 1920 Chagall resigned from the school he had founded and never returned to Vitebsk in his life. Chagall worked for the Theater for three years, during which the instability in the newly founded Soviet Union became more unstable. Lenin suffered rehabilitating strokes died in 1922, which allowed Josef Stalin to slide into power, out maneuvering Leon Trotsky. By the time Lenin died in 1924, Chagall’s supporters had lost power and the government was no longer supporting him. But the artist had returned to Paris, which would become his permanent home.